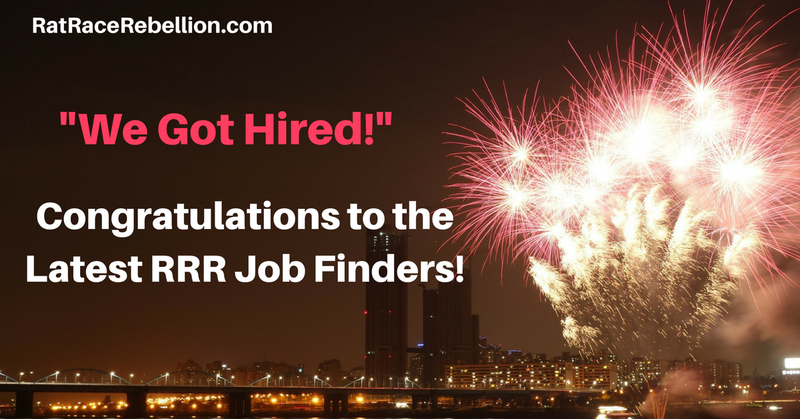 Work from Home Jobs – “We Got Hired!” – Congratulations to RRR Jobfinders! Please join us in congratulating everyone who has found work from home jobs and gigs at RRR during the past few weeks and posted to our Facebook page or emailed us. (We’ve excerpted some of the messages below.) Well done to everyone! We wish you every success in your new work from home jobs and side gigs! “Hello Rat Race! This is my second time using your site for work at homes. So now I currently have 2 jobs from using your site. I currently work at Amazon and have been since October 2016 and I was just hired with KellyConnect from using your site once again. Thank you guys so much! I have recommended RRR to everyone I know. Thanks again.” — Michelle N.
“I just wanted to message you guys and say thank you so much for this site honestly and to keep doing what you are doing , seriously. I have been hired through Kelly Services for their Apple program, I have received offers from U-Haul, Hyatt and Ver-A-Fast. You guys are perfect !! !” — Jimika G.
“Hey guys! Just wanted to say thanks for the work you do for those who want to work from home. I first heard of RRR in 2010 when I found a job with Alpine Access. It wasn’t posted on your site, but you provided the starting point that lead me to them. After a few years there, I found a post for Apple and got hired there. I had to leave after 4 years after a messy divorce left me without a home I could work from. Now, just a year later, I’m returning to Apple by way of KellyConnect. Thanks for continuing to be there for those of us who depend on your resources in the work at home world!” — Les C.
“Just wanted to drop you a ‘Thank you’! If it weren’t for this site and all the work you do to find these opportunities, I wouldn’t have found the job I was just offered. Now I get to do tech support from home!” — Jammie L.
“I just got hired at KellyConnect and Appen thanks to you guys! I appreciate your existence! Keep it going!” — Melissa H.
“I just want to THANK YOU for all the work put into this site. I have received offers for multiple, reputable, good paying employers and have accepted an offer with a job in my field! I was paying a site (FlexJobs) and never received any good leads. I tell everyone I know about Rat Race Rebellion. You all are by far the BEST option out here for those seeking remote jobs.” — Miss A. “I just went through the process and today I just had my Interview with KellyConnect for a chat agent position at Apple. Thank you so much your blog is awesome!” — Carolyn S.
“Dear Chris and Mike: I’VE BEEN HIRED! Thanks to a job lead for U-Haul responded to on RatRaceRebellion. I interviewed and was offered the job today (Fri Mar 2). Thank you for providing excellent, valid job leads for remote work.” — Idellah A. “I did get hired with Conduent. Training begins April 6th.” — T.W. “Hello… I will be starting with Sykes on the 26th!!! !” — Ebony F.
“I am so glad I found your page a couple months ago! I was hired full time to work for Hilton at home the last time you guys shared about them hiring. I have gotten two paychecks so far and love the company! Thank you, Rat Race Rebellion! Congrats to all the others that have found work!” — Keri B. “I got hired by Lionbridge !!!!! !” — Shakita H.
” I got hired by Hyatt today.” — Lisa T.
“Hilton Reservations!! !” — Sanovia W.
“Thanks to RatRaceRebellion I am now employed by U-Haul. My start date for orientation is 2/19/2018. I am excited and can’t wait to start making money. Pay starts at $10.00 an hour. All training is paid.” — Danita J. “I found Concentrix through this site and was hired in December of 2016 and I have been promoted several times since being hired. Thank you RRR! You are awesome!! !” — Dante B. “I got hired with Concentrix for Tech Support. Thanks so much for this group!” — Brad S.
“Thanks RRR 1st day of training with Transcom today! Very excited.” — Licia S.
“Thanks to RRR I applied and got hired with Hilton as a Reservation Specialist $9.00 plus commission! I get to stay home with my son and not be in rush hour everyday! You guys helped make a big difference in my life! Thank you RRR.” — Cheyto R.
“So far have been hired at 3 jobs found on RRR! You guys are excellent in weeding out the scams. Thank you RatRaceRebellion!” — Ayaliah F.
“Hey RRR! I got hired at NexRep and I am going to love it! I just finished the training and will be live on the phones in a day or two! I just wanted to say thank you to the both of you who are so dedicated in helping people find legit jobs working from home. YOU ARE AWESOME!!! Thanks again!” — Shari D.
“I just got hired with U-Haul and start my training 3/12 (orientation is 3/5). I can hardly wait. Thanks Rat Race Rebellion – I found them because of you!” — Peg F.
“Thanks to RRR I was able to get my work at home job that I’m currently in training for! Thank you guys for posting updated jobs for this momma to be able to work from home after being out of work for 3 months! “I start my new PT online (WFH) gig on March 5 thanks to RRR. Thank you!” — Joan G.
❤ I’m so happy I found your site. Thank you!” — Jasmine J. This entry was posted in Success Stories - "I Got Hired!" and tagged HIRED. Bookmark the permalink.